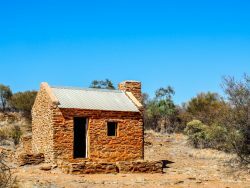 I decided to only stay two days at Ross River in the East McDonnells so I am less pushed to get to Quorn. They have a well-treed campground with some grass which they are trying to rejuvenate. One thing about the place is that it is not busy, only five other camps. 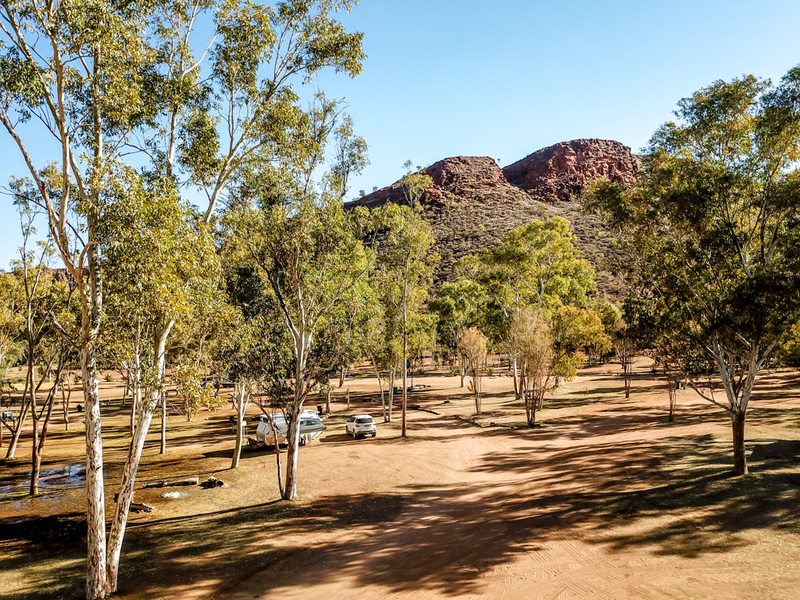 The campground is surrounded by rocky hills on both sides, a very pleasant outlook. My camp is in both photos near the centre (white car). 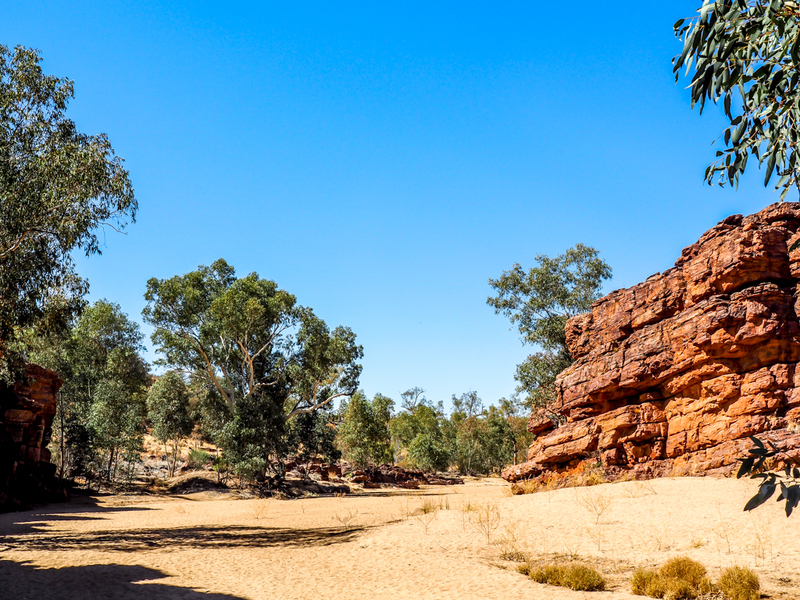 After setting up I got a picnic lunch ready and headed for Arltunga Historical Reserve. 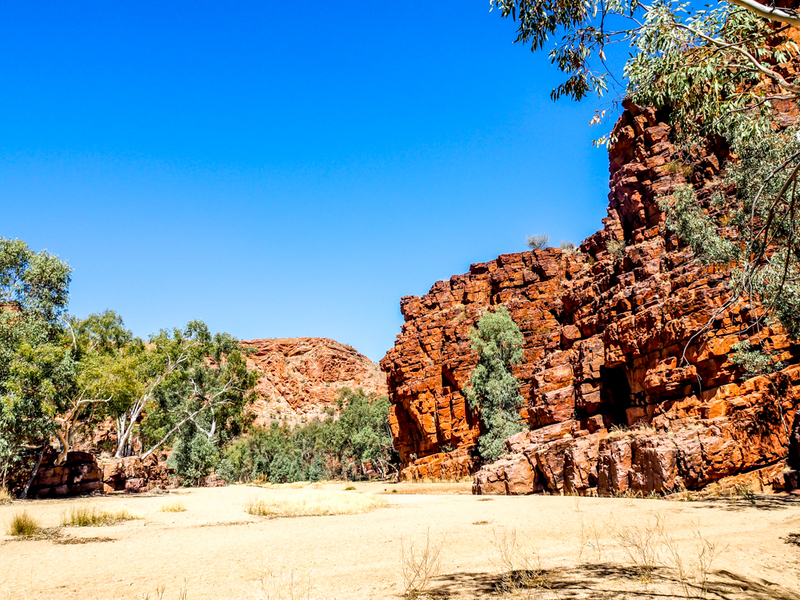 This reserve contains the ruins of a gold mining settlement established around 1897. 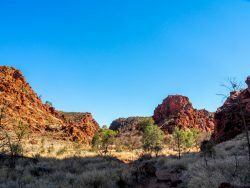 You travel there via Binns Track initially put in by Bill Binns, a ranger who had to visit 6 or so small reserves in the East McDonnells. The track he made saved him having to backtrack to the Stuart Highway between every reserve. It is still a fairly rough and winding track. A number of the buildings have been rehabilitated and others are still ruins. The police station was built in 1916 to replace one that was nearly a ruin already and that did not have a lockup. The policeman used to shackle prisoners to his bed. 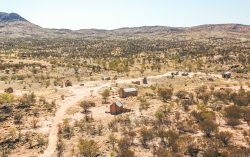 I put the drone up to take an overview of the settlement, the police station is about 1 Km away from the settlement. 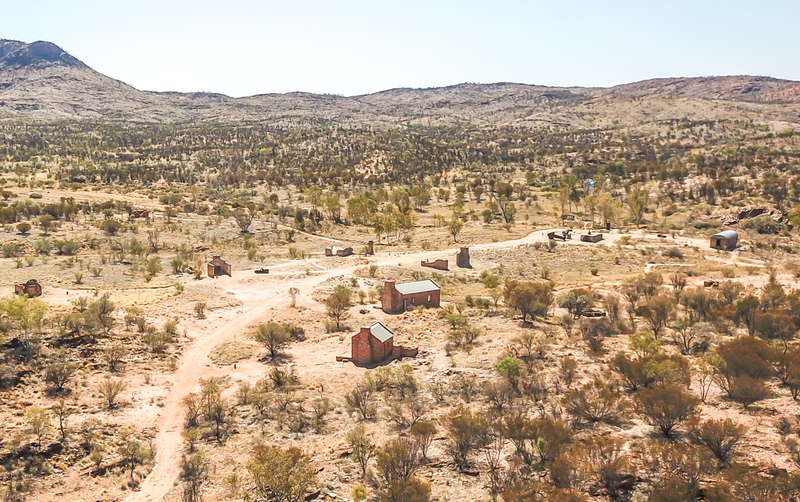 This is possibly because the station site was established first and the settlement was built near a reliable well that would be used to feed the stamper and boilers. 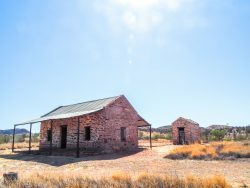 Even though mining ceased in the early 1900s the police station stayed here and was manneduntil 1945 when it was moved to Hasts Range. The mining settlement had an assay office, then a second was built because the miners complained that the first one shook so much with explosions during mining that the assayer could not be sure of weights. 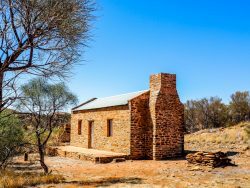 Other buildings were a Post Office, a managers house, blacksmith shop, gold office, boiler-house, 10 stand ore stamper, and miners cottages. The photos below are of the manager’s house (left) and the first assy office. There are a couple of picnic areas at Arltunga and the one near the information centre is very nice with gas BBQs, so I had lunch there. The information centre has lots of historical information and a lot of relics, there is also a small cinema where you can watch a 20 minute video on Altunga, but the power failed when I was 2 minutes into the video! 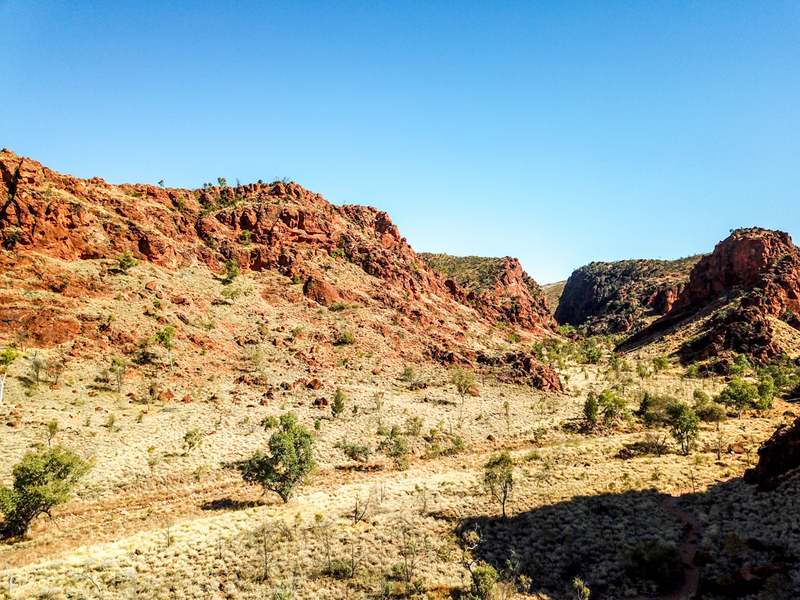 So off the Trephina gorge,not a spectacular gorge but worth a visit. 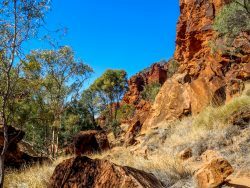 The walk into the gorge is only 500 metres, but there are longer walks to the top of the gorge and other places of interest. 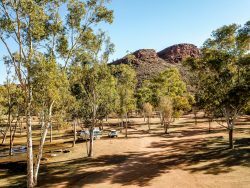 There are also 3 well organised treed campgrounds within 1 Km of the gorge and a picnic area with gas BBQs. You enter the gorge along the creek between rocky escarpments and then the gorge takes a turn to the right. The view coming out of the gorge is also excellent. 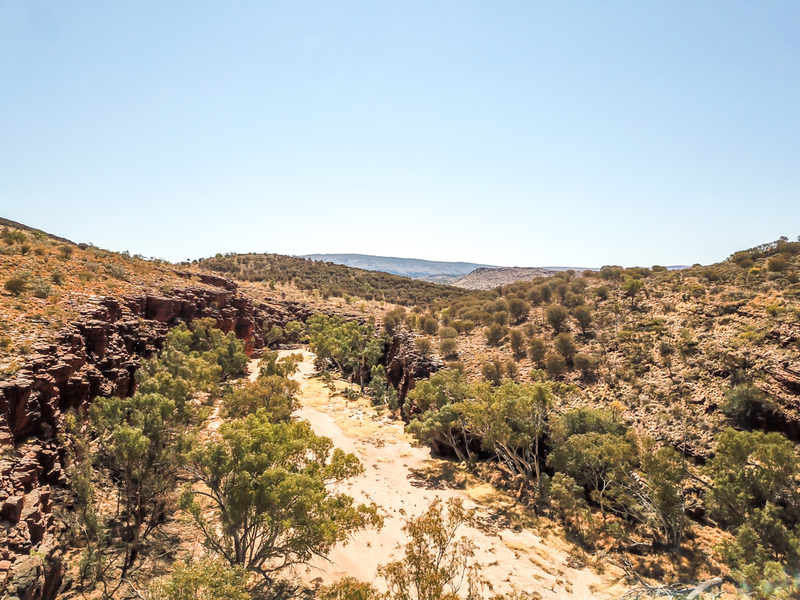 When I got back to the car I set up the drone and took an aerial shot of Trephina gorge. Next day it was off to visit N’Dhala gorge. 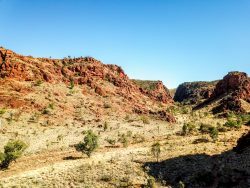 The road to N’Dhala gorge, another part of Binns Track, runs passed the campground so it is easy to access via 11 Km of twisting, rocky, sandy track with 6 river crossings – all dry. 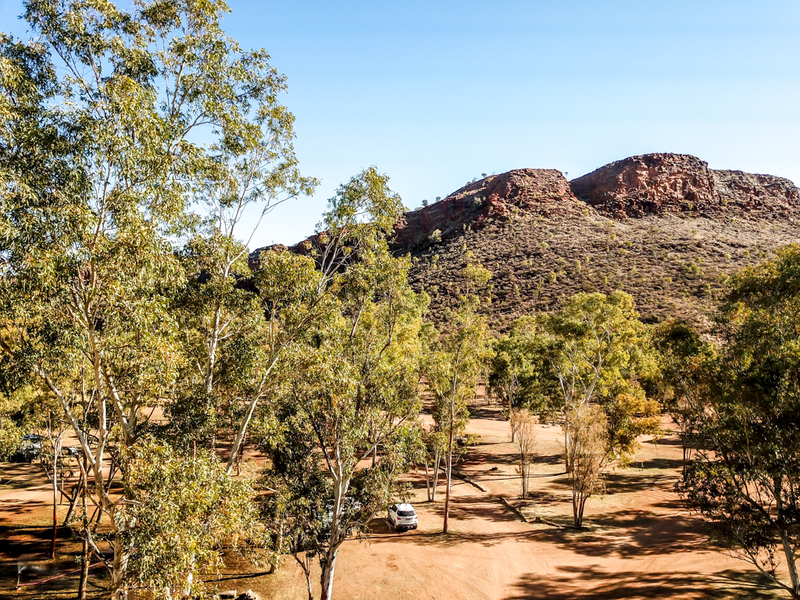 It was an easy drive, a bit rough in places with some corrugations but better than a lot I have driven lately. The walk into the gorge is 3 Km return and is an easy walk with some rock scrambling. The gorge looks inviting from the start, both from the air and on the ground. I started in thinking I may not do all the walk, but when I gor to the end I was disappointed, there was a really nice feeling about the place that I enjoyed. 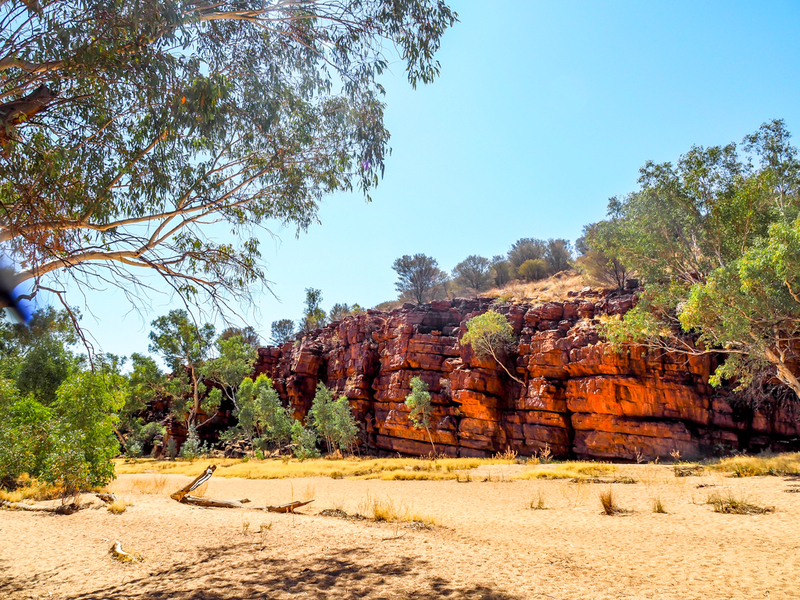 There are several waterholes along the gorge, which retain water for about 3 months after good rain. 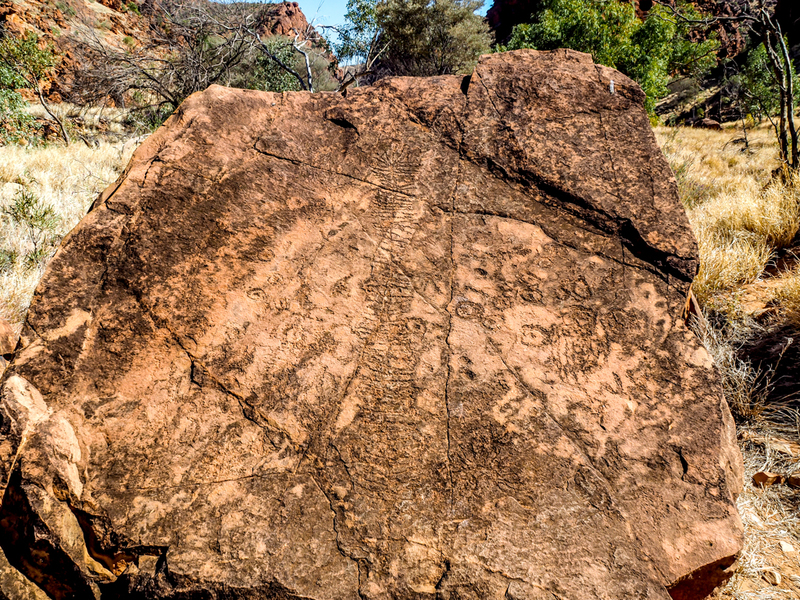 This made life easy for the aborigines and they had time to make petroglyphs in the rocks. Their dreaming around the gorge is about caterpillars and the photo on the left shows (just) a track from the bottom to the top, which is of a butterfly walking and testing its wings, at the top it flies away and becomes a star. 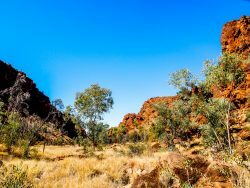 The aborigines beat the christians with their assent into space. The one on the right is of unknown meaning to us. These petroglyphs are between 2,000 and 10,000 years old. 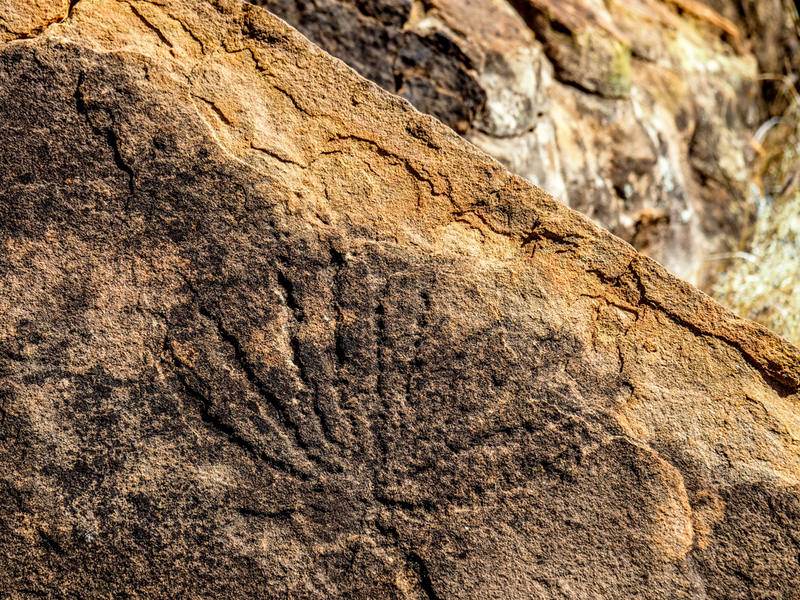 They are made by holding a hard sharp stone and hitting it with a heavier stone, called pecking. 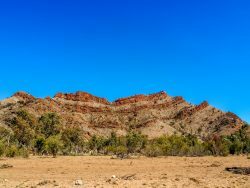 On the drive to and from the gorge you pass a rock formation that represents seven sisters to the aborigines and their dreaming. 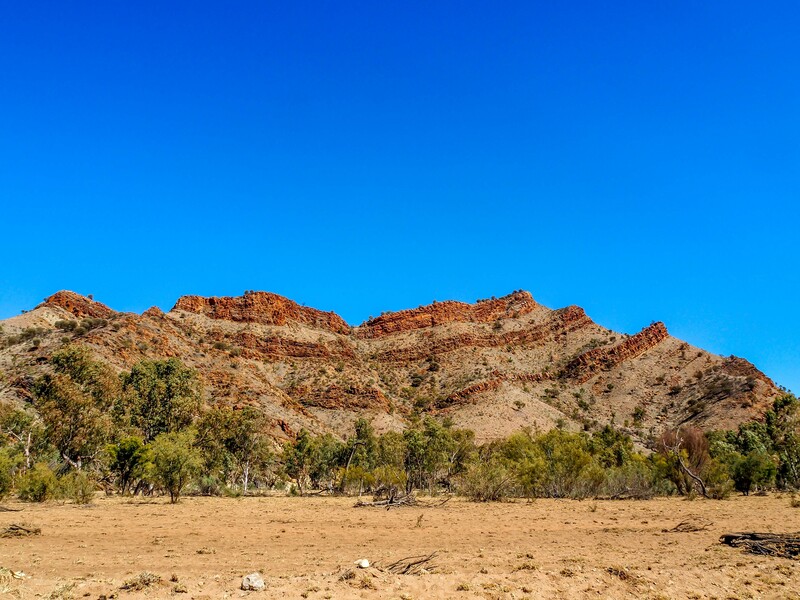 They clearly show the strata that is so commonly visible at all sorts of angles in the McDonnell Ranges. I have enjoyed my time around Alice Springs, there is lots to do and see, but I am well over having dust over everything. Nothing is clean, you wipe things down and next day they are coated again. It just floats in the air, you don’t have to be driving on dirt roads to get things dusty. Its lucky I have a light brown floor in the van, it stays looking clean even if it isn’t. So down the Stuart highway tomorrow. It’s tomorrow now (Wednesday) and I got an early start, on the road before 7, so I decided to go to Marla, a trip of 550 Km including a diversion into The Alice for fuel. Tomorrow I will head to Glendambo, 488 Km, and then on Friday into Quorn, only 326 Km. So I can have a couple on nights in Quorn and then head out to a farm near Quorn for a few nights. Good to read more of your journal, Russ. Enjoy being dust-free! I will David. It’s worth putting up with it to see beautiful places but for me 3 and a bit weeks is enough. Your visiting places around the Alice I have not heard of; hope not too desolate and nice to have some fellow campers. Enjoy! Not desolate, just dusty! It is good to meet and chat with fellow campers, especially around a campfire.